Overexpression of α-synuclein (SNCA) in families with multiplication mutations causes parkinsonism and subsequent dementia, characterized by diffuse Lewy Body disease post-mortem. Genetic variability in SNCA contributes to risk of idiopathic Parkinson's disease (PD), possibly as a result of overexpression. SNCA downregulation is therefore a valid therapeutic target for PD. We have identified human and murine-specific siRNA molecules which reduce SNCA in vitro. As a proof of concept, we demonstrate that direct infusion of chemically modified (naked), murine-specific siRNA into the hippocampus significantly reduces SNCA levels. Reduction of SNCA in the hippocampus and cortex persists for a minimum of 1 week post-infusion with recovery nearing control levels by 3 weeks post-infusion. We have developed naked gene-specific siRNAs that silence expression of SNCA in vivo. This approach may prove beneficial toward our understanding of the endogenous functional equilibrium of SNCA, its role in disease, and eventually as a therapeutic strategy for α-synucleinopathies resulting from SNCA overexpression. The importance of α-synuclein in the pathogenesis of Parkinson's disease (PD) initially emerged in 1997 when Polymeropoulos and colleagues reported that a missense A53T mutation in the α-synuclein gene (SNCA) causes familial parkinsonism in four seemingly unrelated kindreds . Subsequently, SNCA A30P and E46K missense mutations were found to cause familial Lewy Body parkinsonism [2, 3]. The importance of the α-synuclein protein (non-amyloid component precursor; NACP) was confirmed through its recognition as a major component of both Lewy bodies, the pathological hallmark of PD and dementia with Lewy bodies (DLB), and of glial cytoplasmic inclusions in multiple system atrophy (MSA) . In addition to missense mutations, multiplication of the normal SNCA locus can cause familial PD. Singleton et al. first reported genomic triplication of the SNCA locus in affected family members with early onset, parkinsonism, with subsequent cognitive dysfunction . Post-mortem exam revealed profound neuronal loss in the substantia nigra (SN) and widespread Lewy pathology from the cortex to the basal ganglia [6, 7]. Additional de novo SNCA duplications and triplications have since been reported in French, Japanese, Korean and Swedish-American families [8–14]. Functionally, SNCA multiplications result in a copy-number related increase in both α-synuclein RNA and protein [8, 15], and disease onset and severity are associated with gene dosage . Taken together, this provides compelling evidence that SNCA overexpression can result in Lewy body parkinsonism and dementia. Although SNCA multiplication remains a rare cause of inherited PD, common genetic variability in the SNCA locus is a risk factor for idiopathic PD [16–18]. The effects may be mediated by elevated mRNA/protein expression [8, 15, 19, 20]. Hence therapy aimed at reducing SNCA expression levels may provide therapeutic benefit for patients with either familial or idiopathic PD. The use of double-stranded RNAs for the silencing of genes was first accomplished in nematodes . Molecules of 21 and 22 nucleotides had the most activity in Drosophila, and these reagents were named short interfering (si)RNAs . siRNA induces the formation of an RNA-induced silencing complex (RISC) which acts as an endonuclease on target RNA , yielding a powerful tool which can be used to reduce expression of specific genes. To exploit the therapeutic potential of siRNA, we developed naked siRNA molecules against SNCA that are resistant to endo- and exonuclease activity in serum and yield species-specific reduction of SNCA in vitro. We then injected them into the Cornu Ammonis (CA1) of the hippocampus of mice and demonstrated a reduction in SNCA mRNA levels by quantitative reverse transcription-polymerase chain reaction (RT-PCR) and in situ hybridization throughout the hippocampus and cortex. Additionally, we have demonstrated that α-synuclein protein expression in these same cells is qualitatively reduced. This protocol will be invaluable for improving our understanding of the in vivo dynamics of SNCA, assessing the impact of SNCA silencing in the pathogenesis of animal models of PD, and perhaps may hold promise as a future neuroprotective therapy for PD in humans. Detailed method for in vitro studies including siRNA synthesis, cell culture and transfection conditions, fluorescent microscopy, RNA and protein analysis and siRNA serum stability analysis are detailed in the additional files section. All rodent procedures were approved by the Mayo Clinic Institutional Animal Care and Use Committee (IACUC), were in accordance with the National Institute of Health Guide for the Care and Use of Laboratory Animals (NIH Publications No. 80-23, revised 1996) and were performed under the supervision of an institutional veterinarian. Mice were allowed unrestricted access to food and water and were supplemented with gelatin containing (32 mg/ml) acetaminophen from 24 hours prior to surgery until 48 hours post-surgery to minimize pain. The day prior to surgery, Alzet osmotic pumps (model 1002, Durect, Inc., Cupertino, CA) were filled to capacity with siRNA against SNCA or luciferase at a concentration of 2 mM in phosphate buffered saline (PBS). Pumps containing only PBS were prepared for an additional control group. Mice were anaesthetized with tribromoethanol (200 mg/kg) and stereotaxic surgery was performed to implant a 3 mm cannula at -1.5 mm posterior and -2.0 mm lateral from bregma and 2.5 mm deep by the insertion of 2 spacers (0.25 mm each) to target the CA1 of the right hippocampus in each 2-month old C57BL/6 female mice . Cannulae were secured to the skull using Loctite adhesive (Durect, Inc., Cupertino, CA). Mice were allowed to recover from the anesthesia under a heat lamp. SNCA siRNA, luciferase siRNA or PBS was infused at a rate of 0.25 μl/hour over 15 days using Alzet osmotic pumps attached to 3 mm brain infusion cannulae (Alzet brain infusion kit 3, Durect, Inc., Cupertino, CA; http://www.alzet.com/products/brainkits.php). Following 15 days infusion, brain tissue was harvested from the 2 week (2 W) cohorts while cannulae were removed on day 15 in cohorts that were allowed to age one week (2 W-1 W), two weeks (2 W-2 W) or three weeks (2 W–3 W) after the cessation of infusion. At harvest, osmotic pumps were recovered. Mice in which the pump had failed or in which the tubing had become disconnected from the pump were included in study groups and in statistical analysis; however, for graphical purposes, the data points for these mice were denoted by distinct symbols when compared to mice in which the pumps were intact and functional. Experiments detailed in Figures 1, 2 and 3 were performed on independent cohorts of mice. qRT-PCR analysis of SNCA expression following in vivo RNAi. SNCA siRNA (syn-siRNA), luciferase siRNA (luc-siRNA), or PBS was infused into the right CA1. qRT-PCR was used to determine expression of SNCA following RNAi in treated right side compared to the untreated contralateral side (R:L ratio). SNCA siRNA had a statistically significant decrease of SNCA expression in the right compared to the left side of the brain, and R:L ratios were decreased when compared to controls (vs PBS, p = 0.036; vs. luciferase, p = 0.004). Horizontal lines show medians. Open circles indicate mice in which the cannula was disconnected during treatment or did not function. RNA and protein analysis of α-synuclein expression following in vivo SNCA siRNA treatment. The right CA1 was infused with either PBS, siRNA to luciferase, or siRNA against our SNCA target. A typical SNCA in situ from an animal treated with (A) PBS or (B) SNCA siRNA on the right side compared to the uninjected left sides. While the cannula tract was evident in the right hippocampi of the infused mice (* in C and F), regardless of treatment group, (C) immunostaining for α-synuclein demonstrates considerable knockdown of protein expression (arrowhead) in the hippocampus when the uninjected control side is compared to the SNCA siRNA-treated side, also shown in higher magnification (D, E), respectively. (F) Inflammatory changes, as shown by Iba-1 immunostaining for microgliosis, were minimal around the infusion site. Sample brain in (F) showed the highest degree of damage from infusion, in this case from SNCA siRNA. Silencing of SNCA is resilient and target-specific. SNCA and SNCB expression was assessed by in situ hybridization following extended timecourse of in vivo SNCA siRNA treatment. Qualitative densitometric analysis was performed on mice treated with SNCA siRNA on the right side of the brain and a ratio showing either SNCA or SNCB expression in the treated (R) and untreated (L) brain was calculated and plotted for each animal within a group. The knockdown of SNCA expression (black circle) persists in the (A) CA1 and the (B) cortex two weeks after cannula removal with SNCA approaching normal levels by three weeks post-infusion. The closed triangle indicates SNCA levels in a mouse in which the cannula was loose at the end of the study. Non-specific silencing of SNCB (open circle) was not observed at any timepoint. For Taqman analysis, the hippocampus was rapidly removed from each hemisphere of the brain and snap-frozen on dry ice in separate tubes. In each case, the right hippocampus represented the injected side (SNCA siRNA, luciferase siRNA, or PBS) and the left hippocampus was utilized as an untreated control. RNA was extracted by phenol extraction using the TRIzol Reagent (Invitrogen; Carlsbad, CA) with the manufacturer's standard protocol. cDNA was then synthesized using the High Capacity cDNA Archive Kit (Applied Biosystems; Foster City, CA). The following probes were purchased from ABI: GAPDH (Mm99999915_g1), HPRT (Mm01545399_m1), SNCA (Mm00447333_m1), and SNCB (Mm00504325_m1). Quantitative RT-PCR was performed on an ABI 7900 HT using a 384 well plate with quadruple sample replicates. Results were analyzed using SDS v.2.2 software and the expression data was normalized to mouse GAPDH and HPRT. Resulting graphs and data were generated using GraphPad Prism v.4 software (GraphPad Software Inc., La Jolla, CA). To ensure sampling consistency, the brain was placed in a tissue matrix and the region anterior and posterior to the hippocampus was removed using a flat blade. The resulting three brain segments were snap frozen on dry ice and stored at -80°C until use. 15 μm thick frozen sections were cut on a cryostat at -18°C throughout the entire hippocampus and air dried for 20 minutes before freezing at -80°C. Frozen sections were removed on dry ice and dried quickly on a slide warmer at 55°C, fixed in 4% paraformaldehyde in 0.1 M Sorensen's Phosphate buffer for 20 minutes, washed twice in PBS and dehydrated in ascending alcohols. Hybridization was performed at 37°C overnight in a moist chamber, with approximately 0.02 ng of [α-33P] dATP (Perkin Elmer, Waltham, MA, USA) 3' end labeled probe per 1 μl of hybridization buffer (4× sodium chloride/sodium citrate (SSC), 1× Denhardt's solution, 50% (w/v) de-ionised formamide, 10% (w/v) dextran sulphate, 200 mg/μl herring sperm DNA). The SNCA probe (5'GGTCTTCTCAGCCACTGTTGTCACTCCATGAACCAC'3) was designed to exon 3. The beta-synuclein (SNCB) probe was designed to the 3' untranslated region (UTR) (5'CAGACAGATTGGCTTTATTCATGGACACACTGGG'3). Specific activity of the probe was at least 1 × 108 counts per minute (cpm)/μg, and after dilution in hybridization buffer corresponded to ~1 × 104 cpm/μl. Control hybridizations contained a 50-fold molar excess of unlabelled probe to determine non-specific signal. Slides were washed in 1× SSC at room temperature (RT) to remove excess hybridization buffer; three times at 55°C for 30 minutes per wash and at RT for 60 minutes. Slides were then dipped for 30 seconds in 70% (v/v) ethanol/300 mM ammonium acetate, then for 30 seconds in absolute alcohol, air dried and co-exposed with 12C microscale standards (Amersham, Piscataway, NJ) to Biomax MS film (Kodak, Rochester, NY) for 7–10 days. Densitometric analysis of the images was performed using a micro computing imaging device and MCID Elite v.7 software (MCID, Imaging Research Inc., Ontario, Canada). Sections which were anatomically asymmetrical, damaged or in which the hippocampus was not visible were not included in the analysis. Five matching areas for analysis were outlined on the left and right hemispheres of each section: cortex including retrosplenial agranular cortex, primary and secondary motor cortex; hippocampus CA1; CA2; CA3; and dentate gyrus (DG) including polymorph layer DG. Optical density readings were calibrated to the 12C microscale standards to give radioactivity quantities in nCi/μg. SNCA densitometry was measured in cortex, CA1, CA2, CA3, and dentate gyrus of the treated (right) side of the brain and compared to corresponding regions in the untreated (left) side in two to four sections per animal. 5 μm paraffin sections were de-waxed, hydrated and washed in PBS. Endogenous peroxidases were blocked in 0.3% hydrogen peroxide in PBS. To allow epitope unmasking, sections stained for activated microglia with Iba-1 were steamed in distilled water for 30 minutes. Unmasking was not required for α-synuclein. Non-specific sites were blocked with 5% non-fat milk in PBS for 30 minutes. Sections were then incubated for 1 hour at RT with a mouse IgG1 anti-α-synuclein antibody (1:500 dilution, clone 42, BD Biosciences, San Jose, CA) or rabbit Iba-1 antibody (1:1000 dilution, Wako Chemicals USA, Richmond, VA) in 5% non-fat milk. Control slides were set up without primary antibody. Sections were then washed in PBS twice for five minutes and then incubated with anti-mouse biotinylated secondary antibody (Vector Laboratories, Burlingame, CA, USA). After washing, sections were then incubated with Vectastain ABC® reagent in PBS according to the manufacturer's instructions. Signal was visualized with DAB (3',3' diaminobenzidine, Vector Laboratories). Statistical analysis for in vitro studies utilized the t-test to compare groups; Welch's modified t-test was used when variances differed. Numerical variables were summarized with the sample median, 25th percentile, and 75th percentile. The Wilcoxon signed rank sum test was used to test whether the median right/left (R:L) ratio of SNCA expression from quantitative RT-PCR differed from 1. The Wilcoxon rank sum test was used to compare qRT-PCR SNCA expression between siRNA and control mice groups; it was also used to compare SNCA densitometry R:L ratio between groups of mice. Graphical exploration was used to investigate trends in SNCA densitometry R:L brain region ratio over different timepoints. Statistical significance was determined at the 5% level. Since siRNAs can be readily degraded in vivo, assays in human serum were performed using modified Mayo 7 and 8 siRNAs (containing either phosphothiorate linkages or 2'-O-methyl substitutions) and enhanced stability was observed (Additional file 5). Modified siRNAs were re-tested for silencing of endogenous SNCA transcript and were found to have maintained their efficacy. A modified version of human specific Mayo8 (Mayo8S2) was selected as the best candidate based on its stability and silencing properties but for in vivo testing in mice it was necessary to modify it to complement murine SNCA mRNA (Mayo8S2M). In vitro testing with either human or murine pEGFP plasmid followed by immunoblot analysis, demonstrated 97% silencing of the murine α-synuclein protein and only 23% of the human α-synuclein protein (Additional file 6). In order to test the ability of naked siRNA to reduce SNCA expression in vivo, we identified the hippocampus and the cortex as having the highest expression of SNCA in the murine brain (data not shown). We subsequently chose to target siRNA against SNCA expression in the hippocampus to decrease variability in our measurements that could be introduced when dissecting out smaller, less defined structures. We delivered Mayo8S2M siRNA against murine SNCA, siRNA against luciferase (luc), or PBS into the right CA1 of the hippocampi of wild-type C57BL6 female mice. Infusions were performed on these inbred female mice to reduce variability that can be introduced by combining genders or by having genetically heterogeneous backgrounds. Continuous infusion of the siRNA or PBS solutions was performed over a period of 15 days with Alzet mini pumps connected to cannulae which were surgically implanted into the right CA1. After 15 days, two pumps containing the SNCA siRNA and three pumps containing the luc siRNA had disconnected. These mice, represented by open circles, are included in the data analysis in Figure 1. The left CA1 was not injected and was therefore utilized for an untreated control. Hippocampal infusion of the Mayo8S2M siRNA resulted in significant knockdown of SNCA when assessed by Taqman quantitative real-time PCR. Normalization was performed against HPRT and GAPDH as endogenous controls. Quantitative RT-PCR analysis demonstrated that SNCA expression was significantly decreased in the right (treated) hippocampus of animals which have received SNCA siRNA when compared to the left (untreated) hippocampus (p = 0.037) as demonstrated by the R:L ratio of SNCA expression. 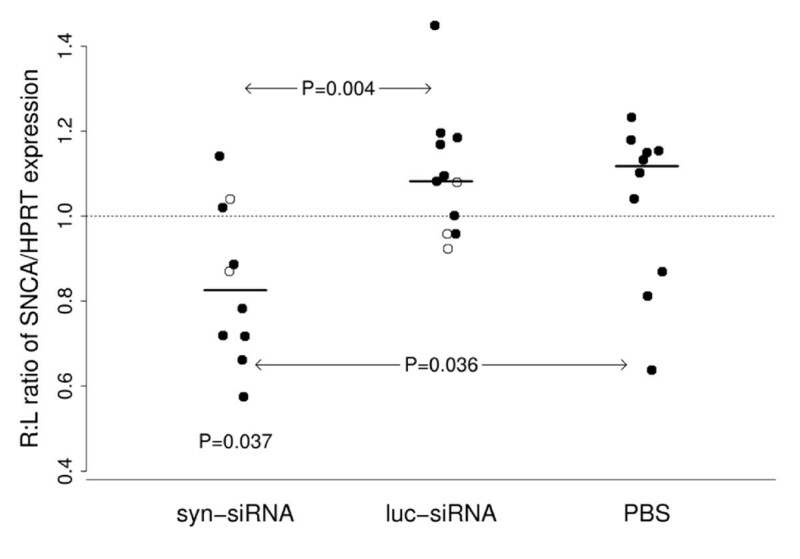 Additionally, the SNCA-specific siRNA reduced SNCA expression when compared to luciferase-siRNA (p = 0.004) and PBS (p = 0.036) treated control mice (Figure 1). Although SNCA expression was significantly reduced in the SNCA siRNA treated hippocampi, we hypothesized that the efficacy of the siRNA in the brain might be underestimated due to partial diffusion of the siRNA into the contralateral hippocampus. In order to address this issue, we endeavored to examine the distribution of SNCA knockdown by in situ hybridization so that the extent of SNCA reduction could be fully appreciated. Utilizing a mouse SNCA specific probe, we determined if the knockdown of SNCA expression extended beyond the CA1 cannulation site (Figure 2). SNCA knockdown with SNCA siRNA was observed an average of 2.67 mm ± 0.57 mm from the cannula tip. While the cannulation tract was evident in the infused animals, in general, little damage nor increase in inflammation (Figure 2C, D, E) was noted at the site of infusion regardless of treatment group, and no animals were removed from the study due to hippocampal damage. Figure 2F shows the hippocampus from the mouse with the most damage at the infusion site. Ratios were calculated for each animal between the treated (right) side (SNCA siRNA, luc siRNA, and PBS) and the untreated (left) side and then compared across each of the three groups (Table 1). The least reduction in SNCA levels, shown as a reduction in right (R):left (L) ratio, was observed in the cortex (71% between PBS and SNCA siRNA treated animals, p = 0.067), likely reflecting the fact that the cortex spans from regions adjacent to the infusion site to regions quite distant from the infusion site and thus less likely to be affected by the siRNA. Significant reductions in SNCA levels were observed in the CA1 (66%, p < 0.001), CA2 (59%, p < 0.001), CA3 (77%, p < 0.001), and dentate gyrus (81%, p = 0.001) when SNCA siRNA treated animals were compared to PBS treated animals. Similar results were obtained when SNCA siRNA treated animals were compared to luc siRNA treated control mice. Reduction in SNCA levels was confirmed by immunostaining for murine α-synuclein protein (Figure 2C and 2D). 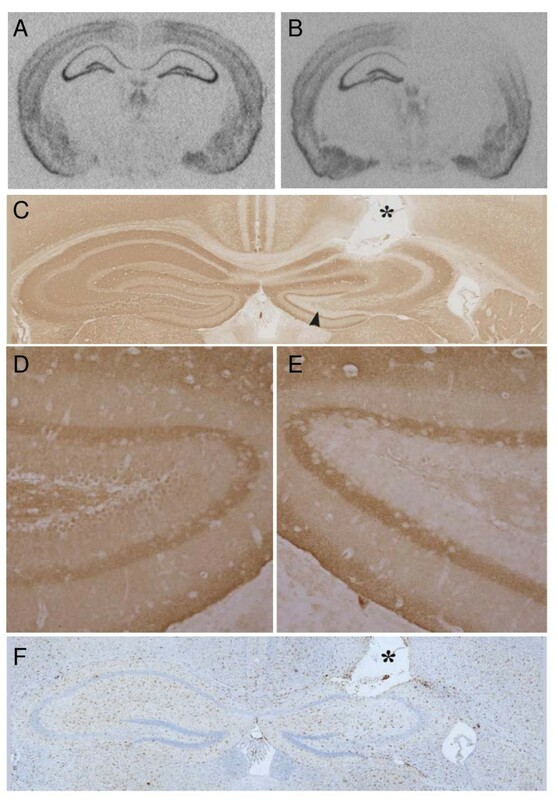 Notably, α-synuclein levels in the cell bodies of the hippocampus were decreased, while α-synuclein in projections from distal regions persisted. Toluidine Blue staining of in situ sections showed that decreased SNCA levels in mice treated with SNCA siRNA were not due to neuronal loss (data not shown). Using densitometry to determine efficacy of SNCA siRNA, SNCA expression in the injected (PBS, luciferase siRNA or SNCA siRNA) right side was compared to the uninjected left side and compared across treatment groups. P-values were derived from Wilcoxon rank sum test and the sample median (25th percentile – 75th percentile) is given. In order to determine the length of time SNCA expression can be repressed following siRNA treatment, we infused SNCA siRNA into the right CA1 of four cohorts. Following 15 days infusion, the first cohort (2 W) was harvested as above, while the cannulae were removed from the remaining cohorts which were then allowed to age for 1 week (2 W-1 W), 2 weeks (2 W-2 W), or three weeks (2 W–3 W) post-infusion. One cannula in the 2 W–3 W group was loose at the end of the study. This mouse, represented by a triangle, was included in the data analysis for Figure 3. Following in situ for SNCA, we observed approximately 60% knockdown in SNCA expression in the right CA1 and cortex compared to the uninjected left side (Figure 3) which replicated our previous experiments. Additionally, similar SNCA reductions were observed in the right CA2, CA3, and dentate gyrus of mice treated with SNCA siRNA (data not shown). SNCA levels remained qualitatively reduced 1 week post-infusion in the dentate gyrus (data not shown) and 2 weeks post-infusion in the CA1 (Figure 3A), CA2, CA3 (data not shown), and cortex (Figure 3B). By three weeks post-infusion, SNCA levels in the cortex (Figure 3B), CA2, CA3, and dentate gyrus (data not shown) of the siRNA infused side approached control levels. SNCA levels in the right CA1 (Figure 3A), the site of injection, remained noticeably reduced when compared to the uninjected control side through three weeks post-infusion. As in the earlier studies, we saw no impact of SNCA siRNA on the levels of SNCB at any timepoint (Figure 3). The use of naked siRNAs in the brain has recently been shown be effective against endogenous murine amyloid precursor protein (APP) , dopamine transporter (DAT), serotonin transporter (SERT) [26–28], and mutant human huntingtin . The use of RNAi to reduce endogenous α-synuclein expression was demonstrated in SH-SY5Y cells as well as the impact of silencing on dopamine homeostasis and response to mitochondrial toxins in vitro . Our study presents the first successful in vivo use of stabilized naked siRNA against endogenous SNCA and also demonstrates that a close homologue of the target gene, SNCB, was not altered by RNA interference with naked siRNA in the brain. This analysis of SNCB is particularly important in demonstrating the specificity of the SNCA siRNA silencing, and in showing that an increase in SNCB expression does not compensate for a reduction in its homologue, SNCA. Furthermore, our study also demonstrates that knockdown of SNCA lasted for up to three weeks post infusion, in the CA1, and that the effect was not limited to the hippocampus, the immediate site of delivery, but also diffused into the cortex. While this study focused on SNCA knockdown in the hippocampus for technical practicalities, it would be of considerable interest to determine if SNCA siRNA would be efficacious in the SN, given its importance in PD. Future work aimed at SN delivery and at silencing SNCA in transgenic mouse models for human α-synucleinopathy or toxin models that develop PD like pathology will further enhance our knowledge on the applicability of naked siRNA in the brain and importantly on the suitability of RNA interference of SNCA as a future therapeutic target. In this study we have characterized naked siRNA duplexes that actively reduce endogenous SNCA mRNA in vitro and in vivo. Following in vitro evaluation of nine siRNAs to assess efficacy, specificity and stability, we selected a candidate (Mayo8S2) for in vivo testing. After modification to complement the murine sequence (Mayo8S2M), we show that direct infusion of our candidate siRNA into the hippocampi of adult mice resulted in a resilient reduction in the murine SNCA transcript level around the site of infusion as well as in more distant sites. This approach will now facilitate a variety of in vivo experiments to temporally dissect the impact of SNCA up-regulation, aggregation and Lewy-like pathology, in cellular toxicity and neurodegeneration. While considerable work is still needed to optimize delivery, distribution profiles, and stability of the siRNA before this technique could be applied in the clinic, our study provides the foundation for such studies and offers hope that this technique may eventually translate into a neuroprotective therapy for α-synucleinopathies, including PD, DLB and MSA. Jada Lewis, Heather Melrose contributed equally to this work. This work was funded by the Michael J. Fox Foundation (to J.L., D.B., and M.J.F.) and the Mayo Foundation (to J.L. and M.J.F.). We thank Richard Crook and Zeshan Ahmed for help with the figures and Faith Conkle, Deb Maloy and the animal care staff for ensuring animal welfare. DB, IT, KC, RB, RKP are employees of Alnylam Pharmaceuticals which is developing therapeutics based on RNA interference. DMM reports a provisional application for patent under 37 CFR §1.53 (c) DMM reports a provisional application for patent entitled "Method of Treating Neurodegenerative Disease". Less than $10,000 has been awarded to date. DMM also reports provisional applications for patents entitled "Parkinson's Disease-Related Disease Compositions and Methods" and "Predicting Parkinson's Disease", for which no monies have been awarded to date. JL designed and managed the in vivo studies, and wrote the manuscript. HM performed in situ analysis and co-wrote the manuscript. DB led the siRNA development and conceptually contributed to the studies. AH performed the in vitro studies, co-wrote the manuscript, and performed the statistical analysis of the in vitro data. CZ and ZH performed surgery prep, surgeries, and animal care. SL, AB, SO, KH, CK performed RNA and protein analysis. IT, KC, RB, and RKP participated in the conceptual and technical development of the siRNA. MH and JC performed the statistical analysis of the in vivo data. DMM contributed to the conceptual design. MJF designed and managed the in vitro studies and significantly edited the manuscript.